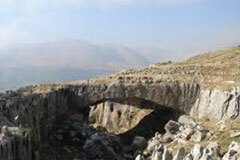 Situated at an elevation of 1550m, Faqra is famous for its temples and its good skiing. 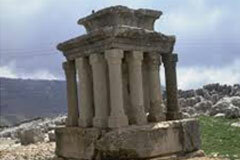 The temples of QalaatFaqra are the most extensive Roman ruins of all Mount Lebanon. A grandiose peristyle of six Corinthian columns of 2m diameter each, like those of Baalbek, overlooks a sacrificial altar and a cella of great hewn blocks. This temple was dedicated to the God of Gods. The site is dominated by a huge tower 15 meters square, which originally had a third story and a pyramid-shaped roof. An interior staircase leads up to the top. A Greek inscription on the northeast corner of the tower and another above the door indicate that the Roman Emperor Claudius restored the building in 43 AD. The temple site is also the venue of a summer cultural festival. About 50m northwest of the tower is a large altar, probably associated with the tower itself. Not far away is a colonnaded altar. The main temple, dedicated to a "very great god," is a rewarding place to explore, with its restored columns and the remains of an altar. It had a square courtyard, which was surrounded by a colonnade on three sides. Continuing down the slope you reach the small temple, dedicated to "the Syrian goddess," a local form of the goddess Atargatis. Also note the basin in the floor and the benches along the side wall. 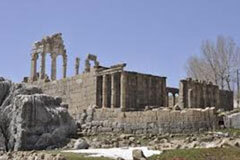 This temple was made into a church in the 4th century AD. Somewhat to the north of these constructions, one sees a fine monolithic bridge whose arch spans a hollow sculpted by the eroding river before its savage leap over the cliff named Blanche. 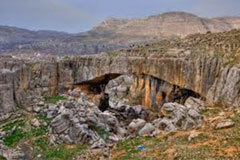 This splendid natural bridge, one of the greatest in the world with its 50-metre span, overhangs a basin full of enormous blocks of stone that have crashed down from the sides. A keen eye easily discovers fossilized seashells embedded in the surrounding strata, dating back 200 million years.